Did you know that if you are searching for information about families or places in Boroondara that Trove is a great place to start online? Well, that is after you have checked the City of Boroondara Library Service catalogue, course! Trove is a portal developed by the National Library of Australia and provides access to a wide range of photographs, maps, digitized newspapers and magazines, books, archives and more. 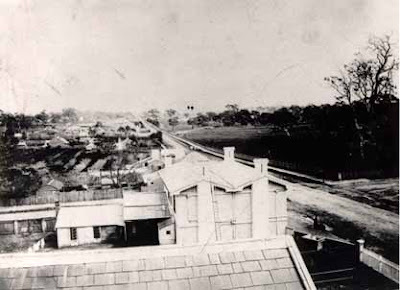 Boroondara's local history photographic collection is available through Trove and in addition you will find material from other collections around Australia that relate to places in Boroondara or to people you are interested in. Trove also harvests from a group on Flickr called Picture Australia: People, Places and Events that many people on Flickr contribute to. So this is another source for material that may be relevant to your researches. One of the most exciting things about Trove is its access to an ever increasing number of digitized newspapers. The OCR doesn't do a perfect job on these so searching can be a bit hit and miss but compared to scrolling through rolls and rolls of microfilm the digitized newspapers on Trove are sheer luxury. They say newspapers are covered from 1803 to 1954. The home page for the newspapers is here. Initially the papers being digitized were daily newspapers from the capital cities and for Melbourne that is the Argus which was published from 1848 to 1954. These entries are being added gradually so keep on checking back in case what you want isn't there. More recently as a result of a joint project between Victorian public libraries and the State Library of Victoria a number of local Victorian newspapers have been added. At the moment the only Boroondara one available is the South Bourke Standard for the years 1861-1873. It is fabulous to have this available as it was Boroondara's first newspaper. It was edited by Apollos Slatterie who was the second Town Clerk of the municipality of Hawthorn and later in charge of Hawthorn's library. The earliest surviving issue is from May 31 1861. You can see an advertisement for Apollos Slatterie's printing office in the middle of page 1 where the Burwood Road address is given as "Main Road, Hawthorn, near Fletcher's Hotel". You can see Fletcher's Hotel in the centre of this photo looking west down Burwood Road. The great thing about digitized records is that apart from scanning them, you can search. So if you search for Slatterie, you can find quite a bit of information about our Apollos including the deaths of his mother and father in England whose notices provide a bit of information about his background before coming to Australia. And other references make it known that before his arrival in Melbourne he was in Sydney in the 1840s in the bankruptcy court. If you haven't tried Trove yet, do try it particularly for the photos and the newspapers. There is a wealth of stuff waiting to be found there.